Absentee voting for the October 7 municipal election begins today at City Hall and Mendenhall Mall. Juneau residents will choose three Assembly and two school board members, and decide on one ballot proposition. 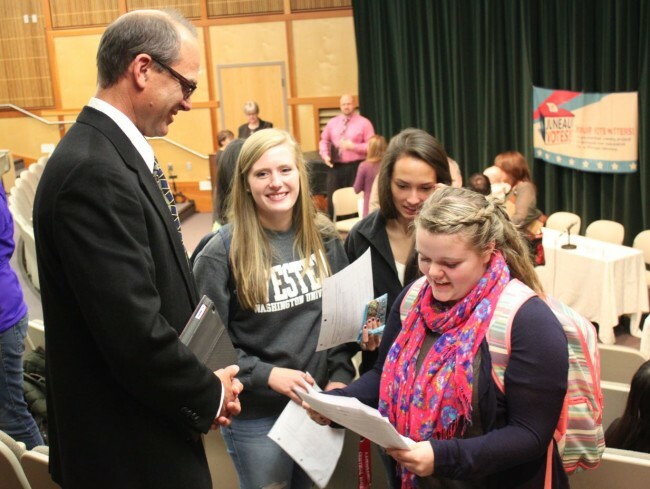 Last week, Thunder Mountain High School students had a lesson in civic engagement. The American government class took a field trip to the Juneau Votes Forum at UAS where they posed questions to the candidates. Coming up with questions was a homework assignment. 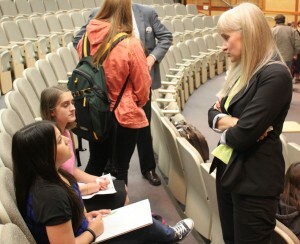 But before the students could do that, they first had to answer this question in class – what is the Juneau Assembly? “Uhhh. We have no idea. We were like, ‘It’s a bunch of people who do stuff,’” says student Sarah Morris. Sarah and her classmates were stumped. “We were kind of like, ‘This is interesting. We don’t even know what they do.’ And I’m 18. I can vote now. What is this?” Sarah says. Some students turned to their phones, their teacher gave them her definition and then the class had a discussion. Now that Sarah has an idea of what the Assembly is, she does have some concerns. “The garbage dump is just horrible and I’m like, ‘Why is it that way?’ And I really think that everybody has really positive opinions about it, but it needs to be changed and just how that needs to be done, I still want to know,” Sarah says. Classmate David Wolfe didn’t get a chance to ask his question. “I wanted to ask if they see the amount of personnel that they have in the government as all essential. I feel like a lot of expenses go towards hiring people and we don’t need as many people in the government system as we do,” David says. Overall, the students were happy they went to the forum. So was teacher Mara Early. “I’m just really excited that they got to come and merge what they learn in the classroom with real life politics in the community,” Early says. Chloe Varner is student body president at Thunder Mountain. She says she’s long been intrigued with politics, but only recently has become interested in what’s happening on the city level. “I just turned 18 so now I get to vote and I get to put my voice out there. I’m just starting to pay attention to what’s going on. I took notes and I’m getting a better idea of who I’m going to vote for,” Chloe says. Now, the students can focus on their next assignment during this election season. In pairs, the students are researching a real candidate in the municipal or general election and playing the role of that candidate’s campaign manager. The students will develop a campaign strategy, advertisement material and write a speech. Next articleAnchorage: A Climate Refuge? Lisa Phu is a reporter at KTOO in Juneau.